Home / Sports / Sergio Ramos will miss the semifinals? Sergio Ramos will miss the semifinals? Sergio Ramos is expected to miss the first semifinal match in the Champions League. 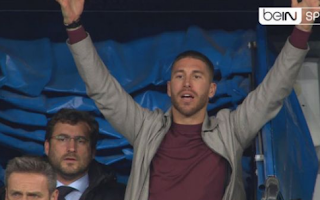 Real Madrid captain Sergio Ramos will most likely miss the first semi-final match in the Champions League after being seen at the tunnel in the last minutes of the Santiago Bernabeu. He was suspended and had to stay in the VIP area, but Ramos went down in the last minutes to the tunnel to reliably support the friends who were missing 0-3 from Juve. COPE reports that Michael Oliver has reported on Ramos's presence in the match and the defender will likely lose the first challenge in the semifinals after UEFA is expected to suspend for at least one match. Roma, Liverpool and Bayern Munich - are other teams that have qualified in the next phase of the Champions League.